Welcome to A ONE INDUSTRIESManufacturer & Exporter of Measuring EquipmentsThe company was incepted in 1980, at Ahmedabad. Our Experienced R&D department& Good financial position make us different from others. Verdhman Yarn, Arvind Mills Limited & Nahar Fiber are some of our esteemed clientsand we are supported by Prompt delivery & Easy payment modes. 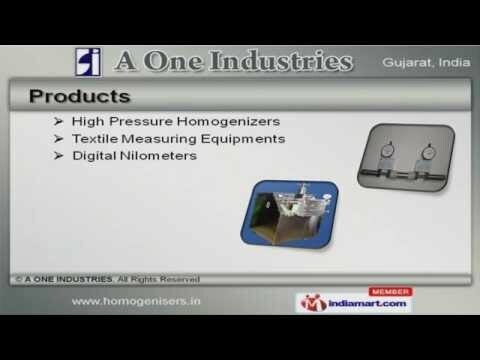 Our product list covers Digital Nilometers, Textile Measuring Equipments & HighPressure Homogenizers. We offer Hardness Testers, Tarp Gauges & Digital Tachometers that are best in theindustry amongst others. Our Measuring Meters, Testing Machines & Equipments are superior in performance. Measurement Instruments & Textile Machines Equipments offered by us are availableat affordable prices. We also provide Wrap Blocks, Fastness & Textile Strength Testers that are a classapart. Along with that we offer Wrap Reels & Refractometers that are some of our best sellingproducts.